One factor holding back an even stronger rebound in home construction has been the tight availability of acquisition, development and construction (AD&C) loans. However, it appears the period of dramatic declines in the outstanding stock of AD&C loans ended in 2012, and recent data suggest that net lending is on the rise. According to data from the FDIC, the outstanding stock of residential AD&C loans made by FDIC-insured institutions rose by $837 million during the second quarter of 2013, a quarterly increase of 2%. It is worth noting the FDIC data report only the stock of loans, not changes in the underlying flows, so it is an imperfect data source. Nonetheless, the stabilization of the stock value over the last year and a half suggests overall improving conditions for AD&C lending. Despite the recent stabilization in residential AD&C lending, there exists a lending gap between home building demand and available credit. Since the beginning of 2007, the dollar value of single-family permitted construction is down 39%. 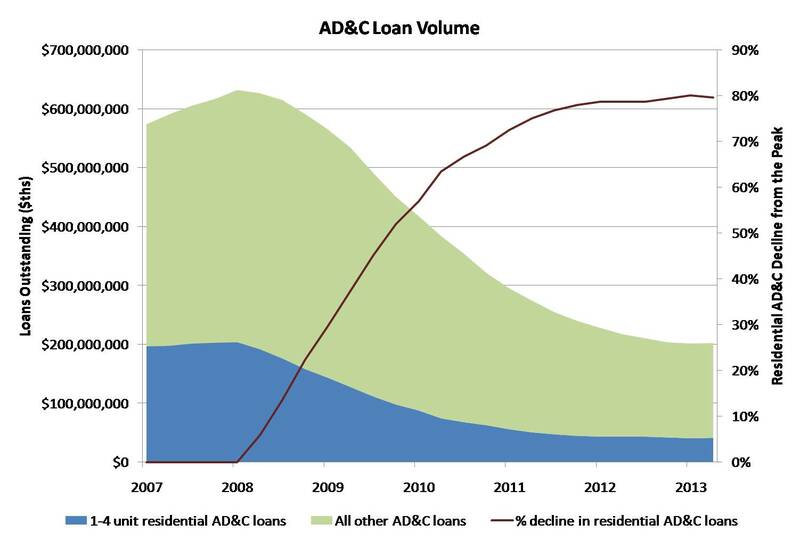 During this same period, home building lending for AD&C purposes is down 79%. This entry was posted on Friday, August 30th, 2013 at 9:50 am and is filed under Data. You can follow any responses to this entry through the RSS 2.0 feed. You can leave a response, or trackback from your own site.